I was once again ensnared by clever, festive packaging at the Trader Joe's checkout display. Also, this review is a desperate attempt to keep my promise to stay away from pumpkin products for a bit. Halloween theme? Yes. Pumpkin? No. 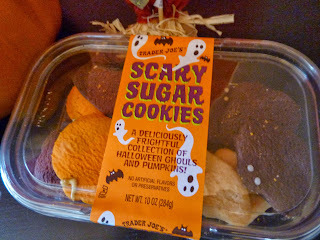 Not to be confused with Halloween Joe-Joe's, these terrifying cookies are shaped like bats, ghosts, and...well, pumpkins. But the pumpkins aren't pumpkin-flavored, they're just pumpkin-shaped, so this still doesn't count as a pumpkin product. But let's get down to the review, shall we? We have fairly run-of-the-mill sugar cookies here. They aren't particularly bad for you compared to other desserts, but there's nothing very special about them either. I'd say these are on par with every other store-brand sugar cookies I've ever had. They aren't exceptionally rich or buttery, and they don't have any special zing: no fruit-juice sweeteners, no cookie butter or cocoa swirl filling. They're just sugar cookies. And not even particularly good ones. The bats have a hint of chocolate flavoring. They were my least favorite. I couldn't really tell a difference between the ghosts and the pumpkins. They were all a shade on the bland side. Each frightening cookie has a couple dabs of icing for eyes, mouth, etc. 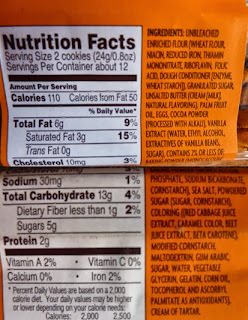 But the icing adds virtually nothing to the flavor of the cookies, although I do wish there were more of it, because it would have added a welcome variation in texture and made them slightly less boring. If it sounds like I'm being critical, it's because I want TJ's to go above and beyond any other grocery store, because I know they can, and they routinely do. Most people, especially folks who might be new to Trader Joe's probably won't be so disappointed with these cookies, because honestly, they're not bad. They're soft enough, sweet enough, and spooky enough for any average seasonal dessert food. But in the end, I just want more for my money. 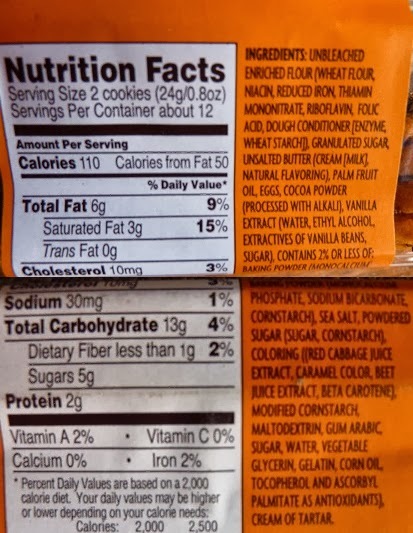 If I wanted to pay $4 for painfully average sugar cookies, I would have gone to Giant or Ralph's. I give these scary cookies 2.5 stars. Sonia gives them 3 stars, stating that their taste is fine, but that they're too crumbly.